I'm wondering why anyone besides Obama (and perhaps Ehud Barak) needs peace talks? Right now the IDF is keeping the Palestinians terrorists subdued. Fatah is terrified of Hamas taking over and is keeping them mostly controlled in Judea and Samaria. Gaza is a lost cause, but as long as they don't shoot too much at us, no one is going to bother with them. Everyone is shopping together in Rami Levies everywhere. Everyone is doing their own thing. Settlers are going to start building again soon, and Arabs will once again have lots of work. I haven't thought this through yet very deeply, but the idea has been in the back of my mind for months now. I figure I might as well present this and see where it goes. What do we gain from a Peace Treaty? The Golan Heights is our quietest border and we don't have a treaty with Syria (or need one). Lebanon is an internal (eternal) mess, and a treaty with Syria wouldn't change anything for us there (Hezbollah works for Iran after all). Perhaps things will reach a boiling point with the PA in a few years, so issues need to be resolved now? Or perhaps, issues will be resolved over time, so why force them now to the forefront? Even look at the Arab villages. Without the Foreign and Leftist instigators, they're much quieter. I think a concerted effort to expel the ISMer would do more for peace than anything else. On the other hand, there is that pesky election issue (or lack of election issue) in the PA. How long can they go without elections, and without a legal leadership? And what happens when they finally have elections and Hamas wins again? So, who exactly are we negotiating with and why? Maybe we should hold off everything until the PA have elections and we see who wins? Does it really make sense to give away more land and resource only to see them taken over by one terrorist group (Hamas) or another (Fatah)? And since the PA won't stop attacking Israel in different arenas despite peace talks or a peace treaty, what do we actually gain? Would a peace treaty derail their attempts to overwrite the State of Israel? I don't think they could ever go far enough to call for an end of the conflict - with all that means - so a peace treaty isn't even possible, and possibly only pushes us closer to a war. The only gain on Israel's side are brownie points with the local media. Anyway. It's an initial thought. An idea that I think needs to be explored and developed. I'm reposting this amazing story from A7. This Shabbat, dozens of Jewish families were stranded in a traffic jam as Shabbat came in and were hosted in the town of Adam (Geva Binyamin). The traffic jam was caused by an accident between an Israeli and Palestinian car between the Hizme and Adam junctions, northeast of Jerusalem. Several Jews and Arabs were injured in the accident, which occurred at 6 PM on Friday evening, and police forces arrived on the scene soon afterwards. By 7 PM, when Shabbat was coming in, traffic was at a near standstill, catching many drivers on their way home before sundown. As driving on the Shabbat is forbidden by Torah law, many Jewish drivers parked their cars on the side of the road, took their belongings, and walked, some of them more than a kilometer, until they reached the Jewish town of Adam. Some even continued to the towns of Pesagot and Kochav Yaakov, which are several kilometers further down the road. The first small groups arrived on foot as the Jews of Adam were beginning their Friday night prayers in the synagogue. "There was a giant traffic jam on the road," said the walkers, breathless. "The sun was setting. We realized we weren't going to make it," they explained, setting down their backpacks and belongings. The word spread like wildfire. Once the townspeople understood the situation, they mobilized immediately, sending several runners to help the stragglers enter the town, alerting the security apparatus, and quickly allocating stranded families to the Adam residents for Shabbat meals and places to sleep. Michael, from the town of Maaleh Michmash, and his 14-year-old daughter were among those stranded. "We were coming back from Jerusalem quite late but we thought we had plenty of time to make it back home," Michael explained to Israel National News, "but suddenly we found ourselves in this huge traffic jam, and at some point it became clear that we were going to have to get out and walk." Michael parked his car on the side of the road, and along with another group of ten Jews, walked with his daughter along the margin until he reached the town on foot. Not one family was left without a host, meals, or a house in which to lodge. "It was wonderful," said Michael. "the people of Adam were so hospitable. Even though the experience of being stuck on the road was totally new to me, and quite surreal, our hosts soon made us feel right at home." One of the parked vehicles was reportedly stolen on Friday night. Later that night, police forces towed the rest of the 11 cars into the town of Adam, to prevent further vandalism, theft, or safety risks. According to another report, Druse residents of the town of Adam helped in the towing effort. Most of the stranded managed to call their families before Shabbat came in, to notify them that they were okay and to prevent unnecessary worry. Adam security officers notified the security teams of other towns, for those who were not able to get the word out in time, to prevent unnecessary searches. "This was a truly beautiful experience," said one of the Adam hosts. "On the one hand, you have Jews who refused to break the Shabbat and got out and walked, and on the other, you have a great case of 'hachnasat orchim', the Jewish mitzvah of hospitality. It was amazing to watch." Busy preparing for Shabbat, so not much time to write. We made chicken soup, Chinese chicken, rice, and a sweet potato dish in the oven. Can't wait to eat it all. There have been a lot of spectacular failures for the allies and successes for the bad guys leading up to upcoming Russian fueling of the Bushehr reactor in Iran. Once this reactor goes online, there is no bombing it and no stopping it anymore. Now this doesn't mean that Iran have a finished nuclear weapon by Rosh Hashana, but what it does mean is that Iran will have a guaranteed unrestricted path to creating nuclear weapons at will, even if Israel bombs its other related locations. I personally will be very surprised if Israel bombs it. We're going to see some serious strategic restructuring in the Middle East as Iran flexes its new muscles. 5791 will prove to be a very "interesting" year. But I just wonder how this weekend will pass. Last week we visited the Israel Museum. They’re rebranding it as the Renewed Israel Museum because of all the changes made to it, both in terms of physical structure and content. It's not quite finished yet, but its getting there. Overall, I give it two thumbs up. I like the new layout. I like the tunnel. I like the Judaica and Archeology sections. The Second Temple Model (formerly at the Holy Land Hotel) was great (could use more shade though). And the Shrine of the Book (along with its Aleppo Codex exhibit) is always fascinating. I think they made the museum less crowded with fewer individual pieces of art and history on display, but they chose the more interesting pieces and organized them better. It’s certainly roomier than I remember. The (dairy) restaurants were good. No meat restaurants though. I couldn’t stand their Modern Art exhibits. I have no patience for what they want to call Modern Art. It’s idiotic. Feel free to disagree, but a mobile of hanging musical instruments, or videos of what could just as easily be fillers on MTV or PBS just doesn’t do it for me. My kids couldn't stop laughing at the "Modern Art" videos - and that alone tells you the level that stuff is at. Point of information: Guards do not appreciate it when children try to play the hanging instruments. What I did like about the Modern Art section is they finally took out that super-annoying audio recording of the guy screaming “Shabbos”. I found it so offensive and annoying to hear that any time you walked near that section. The classical arts section was fine. Point of information: Guards do not appreciate it when children are holding cups of water in their hands in this section. In the archeology section, I kept the kids busy by having them look for the dead bodies. They found them. Point of information: Guards do not appreciate it when children try to look inside the ossuaries. If you haven't realized it yet, if you’re going with kids, make sure the Renewed Israel Museum is having activities in the youth wing that day. My kids spent hours there doing art projects. During the summer they also have kid’s art projects outside on certain days. Overall, well worth the visit - especially with kids. My kids were fascinated with every room we visited, and we hung up the paintings they made on our walls at home. It's Friday, so let's discuss the wall. On Sunday the IDF is going to tear down a Security Wall. No, not the wall that's approaching my house, or the wall that prevents Palestinian Suicide Bombers from entering Jerusalem. They are tearing down the wall in Gilo that stands between Gilo and Beit Jala. The wall was put up 8 years ago, when the Arabs of Beit Jala decided to not so randomly start shooting at Jewish residents of Gilo. These shooting resulted in injuries, death, shock, property damage, and the simple fact that people were afraid to go out into a main city street for fear of being hit by a Palestinian sniper. Over the years, the Gilo wall has been painted with scenery, children's drawings, and other very nice murals. The IDF thinks that the situation in Beit Jala is currently calm enough to return the view to the residents of Gilo. If not, they can always rebuild the wall again. There you have it. P!=NP. In cryptology class, one of the first problems discussed is, is P=NP (or P!=NP). What it means in English is, can a difficult equation that can be verified by a computer in short period of time, also be solved by a computer in a short period of time. In real world terms for example, one question this problem is asking is, can an encrypted message that can be verified as accurate, also be cracked in a short time. The answer to this is important. If P=NP then eventually we will be able to find quick solutions to any encrypted message - and many of our current encryption methods would need to be replaced. If the answer is no, then it is possible to create ciphers, such that deciphering them is guaranteed to take a very, very long time. Consider a jigsaw puzzle. You can look at it and quickly see that it is solved. But it takes time to actually solve it. But need that be so (metaphorically speaking)? There are of course other applications to this problem. The P vs NP problem is considered so difficult that it is one of seven problems that the Clay Mathematics Institute is giving away $1,000,000 to solve. 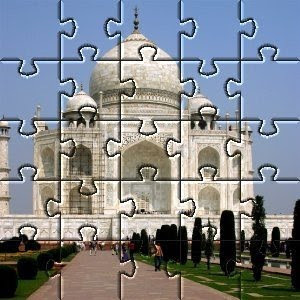 Hewlett-Packard Research Laboratory researcher Vinay Deolalikar in India (hence the Taj Mahal above) is claiming to have solved the P=NP problem in a 100 page document. The document is currently undergoing peer review. You can download it here (PDF) and look for mistakes. There’s an idea (and even detailed plans) floating around the Right lately, in some very serious circles, and that is that Israel should accept and push for a “one state solution”. I’ll admit, certainly if you keep the Palestinian state of Hamastan (Gaza) out of the picture, it does have some points of merit. Israel still remains a Jewish democratic state because we’re still the majority, and probably will continue to be so (and even with Gaza we still would have a Jewish majority). Israel annexes the whole of Judea and Samaria and gradually and carefully naturalizes the Arab population. It certainly diffuses the absurd claims that the Palestinians don’t have democratic representation (though I will admit that since the PA hasn’t had elections for a while, and the term of their Prime Minister expired over a year ago, there is something to that claim, but they’re just blaming the wrong people for that problem). The US trained PA military can be incorporated into the Police, where they’ll get along fine. And finally, everyone can live and build where they want (I can just see Tel Aviv getting flooded with West Bankers, and I would certainly start my expansion). Jerusalem wouldn’t need to be divided according to anybody, and the path of the light rail wouldn’t need to be changed. And finally, we can tear down that ugly wall heading towards the middle of my house. After all, if we can all shop and work in Rami Levi together, a single state isn't such a impossible idea. But unfortunately this idea is seriously flawed. But honestly, all those are superficial reasons. The real reason this idea, or any other won’t work, is because it calls for an end to the conflict, and the Arab leadership just doesn’t want that. If they really wanted it, then everything could have been resolved a long time ago (not to my liking of course), but it hasn't. And it won't. So this plan, just like all the Lefty plans is just another pipe dream that ignores the realities of who we have as neighbors, and that the problem calls for more creative solutions, perhaps solutions that people dismiss and call crazy, though they're no crazier than the same idiotic idea we've repeatedly tried over and over, and that have failed every single time.